Original design by Little Linda Pinda Designs. I love creating such happy Tropical Themed Christmas Gifts. This is a photograph of an actual Florida beach and with my artistic software, I enhanced it and painted the pretty decorated palm trees and created the Ornaments on the palm trees to look like the old fashioned ornaments grandma and grandpa used to have. 3 Christmas presents sit at the foot of the palm trees waiting to be opened. I then created the bright multicolored umbrella and chairs sitting on the beach. This has been my most popular design to date. I was so excited when the first person purchased this design. Thank you so much for shopping with Little Linda Pinda. I pray you will be blessed this Christmas and have a wonderful New Year. Enjoy. 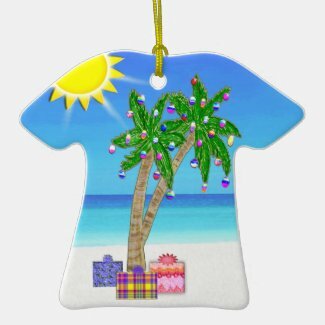 Here is a quick way to see ALL of Little Linda Pinda’s Tropical Christmas Cards, Beach Ornaments and other Beach Themed Christmas Gifts. Many of the products are customizable so you can easily ADD your own Message, Name, City, State or whatever you can think of. Living and Loving Florida. Don’t hesitate to call or email me about making any changes to ANY of my Designs or Adding them to Any of my Zazzle products or if you need help Customizing any gifts. I can easily make changes to ANY of my designs just for you. Look below for Instructions on How to Create Personalization Gifts? Thank you very much for visiting our Beach Christmas Cards gifts. 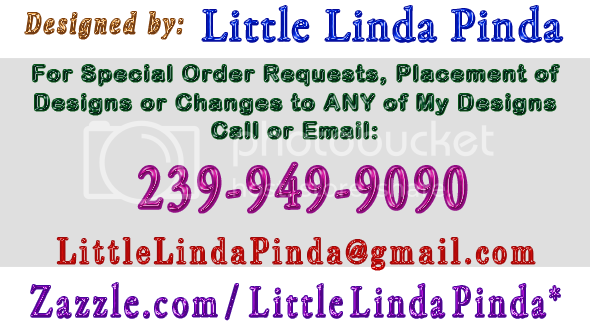 Feel free to call me, Little Linda Pinda, or you can just call me Linda, for CHANGES or HELP personalizing these personalized Christmas Cards Tropical Beach Theme and gifts. 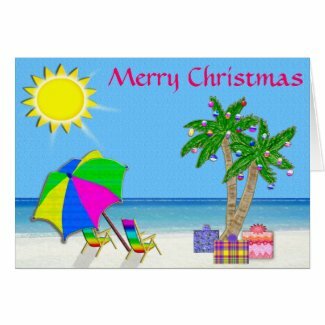 Let me know if you would like me to create Tropical Themed Christmas Cards and Beach Themed Gifts for you and your family, city, state or your special Christmas message.